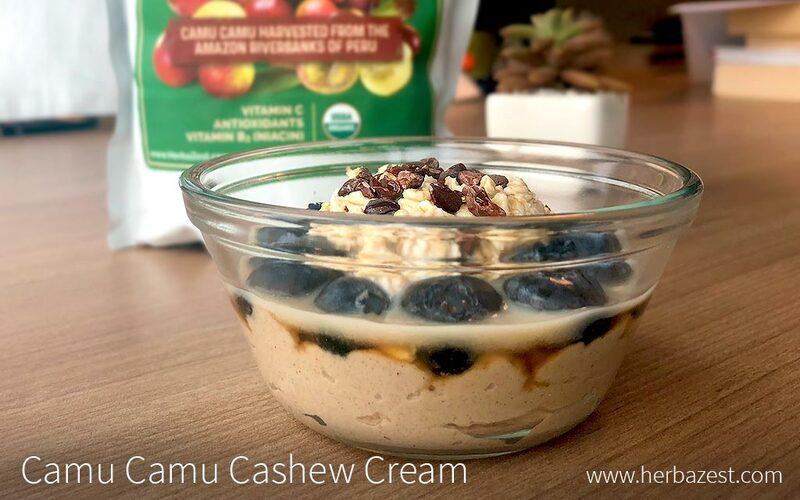 This decadent cashew cream with lime and camu camu will have you coming back for seconds and thirds time and time again. Soaked cashews make for a protein-rich base in this treat. When paired with antioxidant-rich blueberries and energizing cacao nibs, this simple treat will be sure to perk up your taste buds and your day, no matter the time enjoyed. Chill before serving and enjoy! To reproduce this exact recipe for zesty cashew cream, place a few teaspoons of overnight oatmeal into a bowl or a jar. Top it with fresh blueberries, maple syrup, and cacao nibs. For more crunchiness, you might also sprinkle some granola with maca or goldenberry muesli. This healthy treat can also be garnished with other fruits of your choice, like mangoes, kiwi, strawberries, or bananas. ©Copyright 2019. HerbaZest. All Rights Reserved.